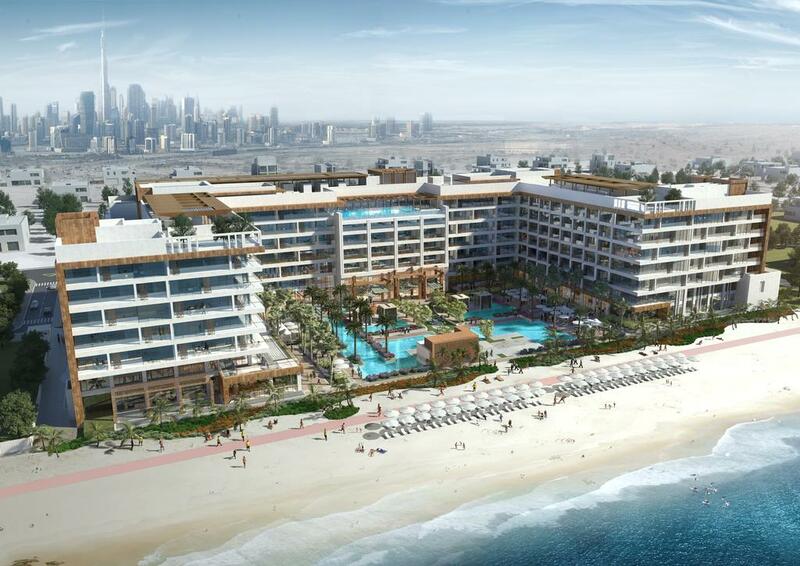 Enhancing Dubai’s Jumeirah beachfront, Mandarin Oriental Jumeira, Dubai is set to bring a new wave of luxury to the shores of Dubai. The resort will feature 178 spacious rooms and 78 elegant suites, all just a stone’s throw from the water’s edge, like no other property in the city. Designed by acclaimed international designer Jeffrey Wilkes, the rooms were conceived as individual retreats on the Arabian Gulf, to evoke a sense of refined and relaxed elegance. Refreshingly contemporary and wonderfully comfortable, the bright blue and earthy colour palettes bring the outdoors in while instilling the rooms with a sense of calm. A magnificent lobby will welcome guests on arrival with a forest of lights leading to the beach front. Fourteen bronze metal trees standing seven, eight and nine metres high – each with 900 lights – create a canopy of crystal and light that glisten and sparkle, just like the nearby ocean. The expansive space opens up onto an outdoor area comprising water features, walkways, stone bridges and teak decks creating a path to the shoreline. Mandarin Oriental Jumeira, Dubai is also home to six unrivalled restaurants and bars, all of which are noteworthy additions to Dubai’s dining scene. Portuguese celebrity chef José Avillez – of two Michelin-starred restaurant Belcanto in Lisbon – will take diners on an authentic journey through Portugal with his vibrant menu at Tasca, while at Warayaki-style Japanese steakhouse Netsu, Australian-born chef Ross Shonhan will lead the way with authentic Japanese cuisine in a dramatic setting. The resort will also be the home to The Bay, a brasserie-style ground-floor restaurant with show-kitchens and family-friendly menus; the relaxing and elegant Noor Lounge, which opens around the clock, will serve guests a delightful assortment of teas, coffees and light refreshments, while The Mandarin Cake Shop is set to become a destination in its own right thanks to its freshly baked bespoke cakes, photogenic patisseries and authentic Arabic sweets. For those who prefer al fresco dining, Sun Vibe is a laidback spot to catch a bite poolside. With a 2,000-square-metre spa and state-of-the-art gym, Mandarin Oriental Jumeira, Dubai is also set to make a splash in the city’s wellness and relaxation market. With nine treatment rooms featuring a VIP Royal Suite, heat and water experiences and a fitness centre, The Spa will be a welcoming oasis offering an unrivalled range of holistic rejuvenation and relaxation treatments. Guests will enjoy Mandarin Oriental’s legendary signature treatments such as Oriental Harmony, and locally-inspired experiences like the Nomadic Sensory, a rhythmic spa ritual that captures the spirit of Emirati Bedouin life, against the soundtrack of the beat of a Doumbek (Arabic goblet drum). Finally, for younger Mandarin fans, Little Nomads kids’ club will help their imaginations run riot with a range of fun activities including a colourful treehouse for hours of entertainment.